The following tutorial demonstrates how to setup RadMultiColumnComboBox and retrieve the selected text and image. 1. Add a RadMultiColumnComboBox and a RadStatusStrip to a RadForm. 2. 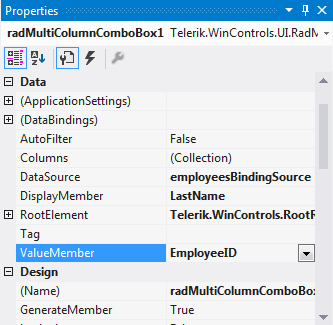 By using the Visual Studio Properties grid and the Data Source Configuration Wizard, set the DataSource, ValueMember and DisplayMember properties of RadMultiColumnComboBox. Thus, RadMultiColumnComboBox will be bound to the Northwind.Employees table. 3. Add a RadImageButtonElement and a RadLabelElement to the RadStatusStrip. 4. In the Visual Studio Properties grid, select the Events tab and double click the SelectedIndexChanged event in order to generate an event handler. 5. Open the Property Builder by using the Smart Tag and uncheck some of the columns in order to control which columns to be visible. 6. Press F5 to run the application and change the selection in RadMultiColumnComboBox.